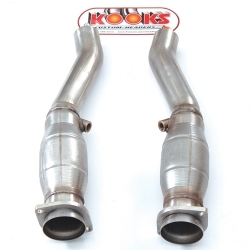 Kooks specializes in high performance exhaust systems for domestic cars and trucks. 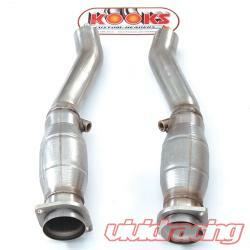 Kooks manufactures exhaust systems ranging from Custom built headers for race applications to bolt on systems for production cars. The Cadillac CTS-V is the perfect blend of luxury and performance, appealing to drivers whom want a sports car in a more refined package. The beauty of the Cadillac CTS-V is its unexpected amount of power and torque. Like any other car, drivers quickly crave more power and a more aggressive exhaust note. An aftermarket exhaust system should be on the top of the list for any CTS-V owner wanting to make more power. Kooks exhaust replaces factory components and are designed to improve exhaust flow allowing the engine to operate more efficiently and therefore produce more horsepower and torque. A Kooks exhaust system improves upon the performance from the factory and the more aggressive exhaust is a subtle hint to the performance that lurks beneath the hood. A Catalytic Converter acts as a screen burning remaining fuel that is unused while leaving the engine. The catalytic converter is one of the most restrictive parts of the exhaust system, greatly limiting the amount of horsepower and torque that can be extracted from your engine. Kooks high flow catalytic converters are designed to bolt on to Kooks headers and increase exhaust flow over the factory catalytic converters. Catalytic converters are often a bottle neck in an exhaust system that has aftermarket headers and a catback system. Eliminating this weak link will allow your other exhaust modifications to be utilized to their full potential.